He expected a tough initiation and he got it, but GermanMaro Engel remains confident he and Erebus Motorsport will be challenging fortop 10 results in the V8 Supercars Championship before the year is out. Engel, 27, was signed by the rookie team to fill the bigshoes of Holden defector Shane van Gisbergen, and has shown flashes of promisein the SP Tool Mercedes-Benz E63 AMG. But they have only been flashes, as the Championshipnewcomer learns the circuits and an under-developed car that has also struck reliabilityissues. “I have full confidence in this structure and this project,”the former DTM racer told v8supercars.com.au. “We have set out on a journey andwe are only at the very beginning of this journey. “Our aim is to make this a winning package and at this stagewe have to ask the fans to have some patience, to give us some time to keepimproving. 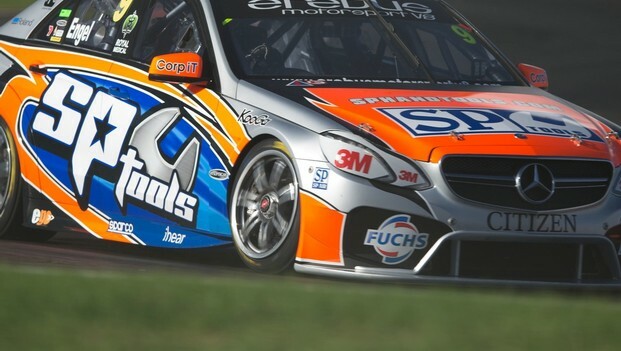 Engel gained the drive with Erebus after a strong test in aStone Brothers Racing Falcon at Ipswich late last year, in which he undercutthe target time set by teammate Lee Holdsworth. He had already impressed his future employer after strikingup a good rapport with the team when he guest drove an SLS GT3 at PhillipIsland, beating Craig Lowndes in the process. Engel’s form and potential can best be gauged against his highlyregarded teammates Holdsworth and Tim Slade and that shows he has the talent toprogress up the grid. He was the quickest of the three Erebus drivers in sectortwo at Pukekohe Park Raceway and came out on top in a heated intra-team battlein the fourth and final race that made up the ITM 400 Auckland. “Tim and Lee have proved they are top drivers in thiscategory so being close to them is good, being ahead of them is certainly verystrong,” Engel said. As will the engine upgrades Engel tested at Morgan Parkyesterday, which are expected to debut on all three cars at Chill Perth 360 inearly May. The AMG M159 V8 engine swaps from dual butterfly manifoldand drive-by-wire throttle to eight butterflies and cable actuation. Thischange is seen as vital in solving over-heating and torque delivery issues andmaking the Benzes more competitive against the rival Holden Commodores, FordFalcons and fellow-newcomer Nissan Altimas. The top 10 is a way to go considering Engel’s highestposition in qualifying so far this year is 22nd and 20th in a race. Hisinexperience on Australian circuits obviously counts against him, as does racinga big, heavy and powerful V8 with a locked rear differential, a technical featurehe has no experience of that carries over from the old V8 Supercars regulationsinto Car of the Future. “The car is very different and so are the circuits and thatis in essence the challenge I am facing. But I am very happy to face thatchallenge,” he said.